1. Stay home and rest if you can. No sense in showing up to work or school and getting everybody else sick. Your body is telling you to rest and if you don't listen the symptoms will get worse. 2. If you feel well enough to go to work or school then let people know that you are getting over being sick so that they don't run in for a big "germ hug" or a "snot hand shake". 5. Don't touch your face! 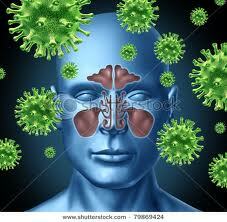 All germs are spread through your mouth, eyes, and nose. If you have to blow your nose or cough repeatedly, then you should be home resting. 6. I know we were all taught to share, but not when it comes to what touches are mouth. It is best to have your own chap stick/lip gloss and stop sharing drinks and food. Another reason is, it is said that 80% of the American population has the herpes virus. Cold sores can be contagious up to two days before they even show themselves, then contagious for up to 2 weeks. The cold months when everyone's immune system is low is a perfect breeding ground for an out break, SO STOP SHARING!!!! Four years ago I was diagnosed with rheumatoid Arthritis and one of the medicines that I have taken on and off is an immunosuppressant. When I am on immunosuppressants my immune system is compromised and I am more susceptible to getting sick. My doctor advises me to try and stay 10 feet away from people who are sick. I realized how challenging this was on a day to day basis. At the same time I was diagnosed with rheumatoid Arthritis I was a single Mother and if I would get sick then my son would most likely get sick and it would turn into days of missed work. These experiences have made me very aware of people's "sick manners" and I have become a pro at avoiding them. I hope to help people become more mindful and compassionate of who they could be affecting when they are sick in public. Check out my other post on what to do if you start feeling sick.